ComScore’s January 2013 numbers are out today, and it has Google (and everyone else) losing ground to Apple. Android dropped for the first time to 52.3-percent from 53.6-percent of U.S. smartphone subscribers, while Apple climbed 3.5 points to 37.8-percent. Both OS’s make up over 90 percent of the base. What’s strange is that the three big U.S. carriers report that iPhone makes up anywhere from 66 percent to 85 percent (Verizon, Sprint, and AT&T) of activations, so it would seem that Apple’s market share should be much higher. 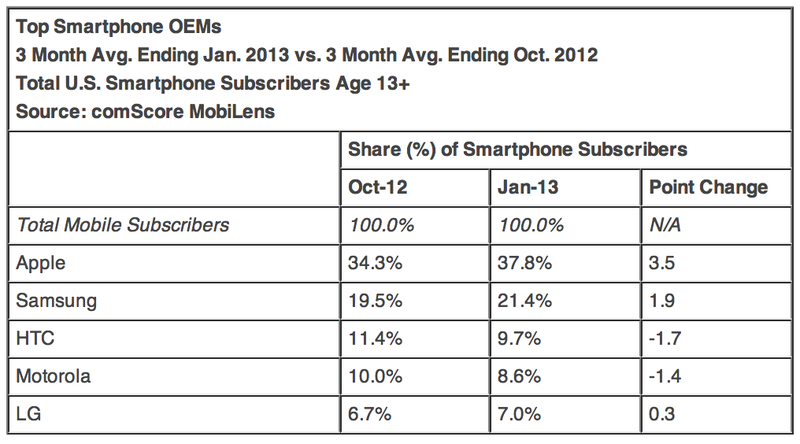 Apple ranked as the top OEM with 37.8 percent of U.S. smartphone subscribers (up 3.5 percentage points from October). Samsung ranked second with 21.4 percent market share (up 1.9 percentage points), followed by HTC with 9.7 percent share, Motorola with 8.6 percent and LG with 7 percent (up 0.3 percentage points).